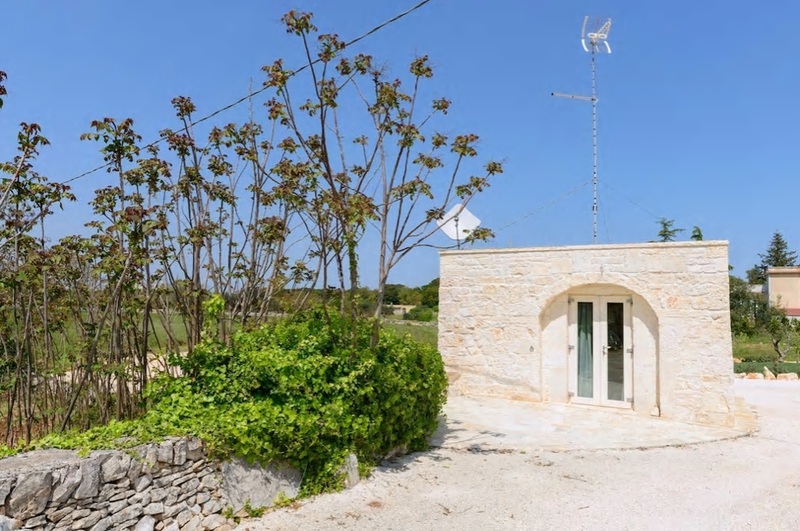 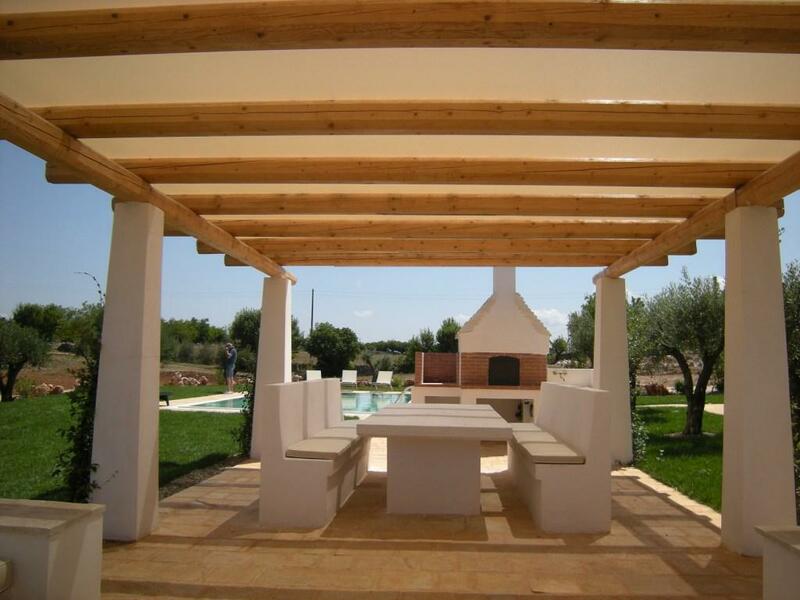 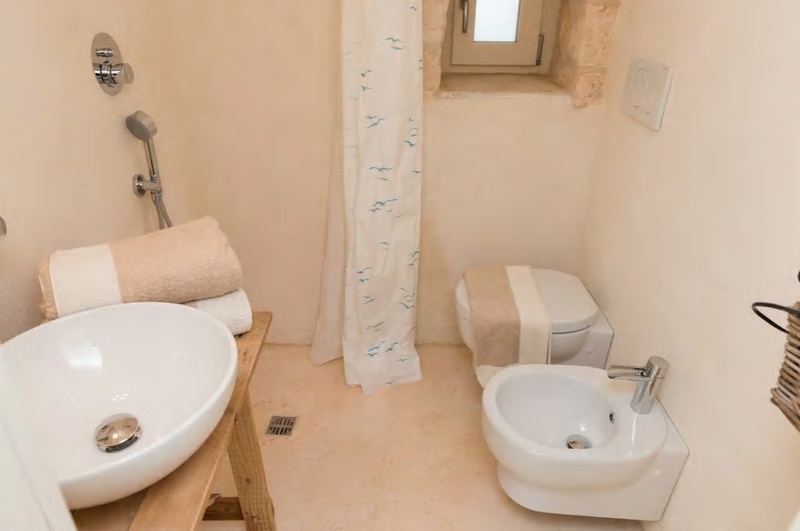 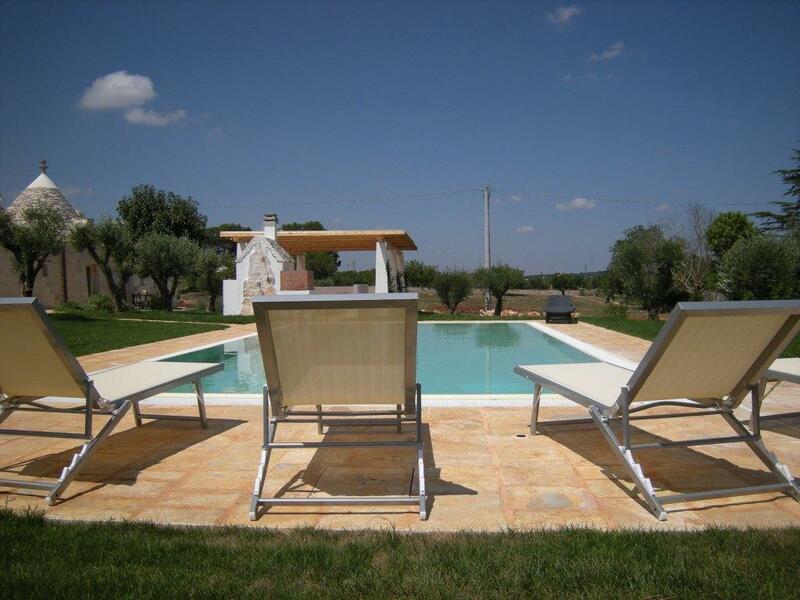 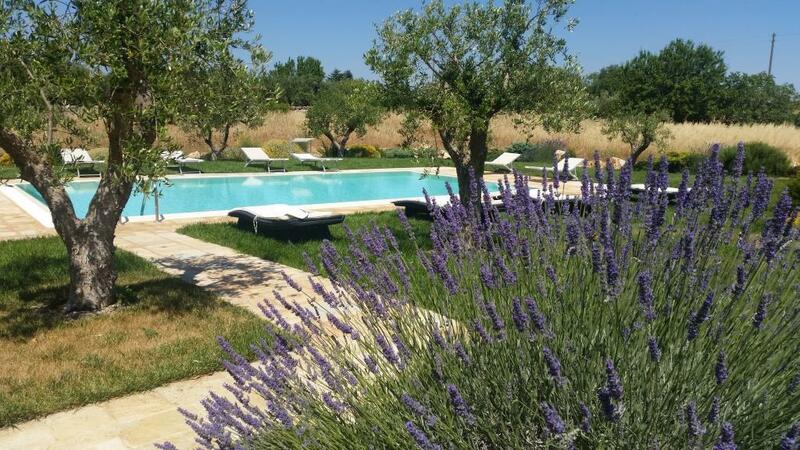 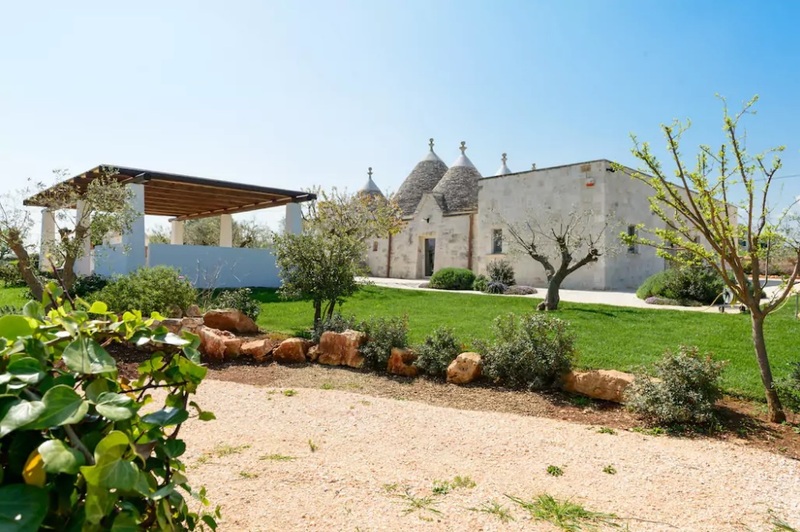 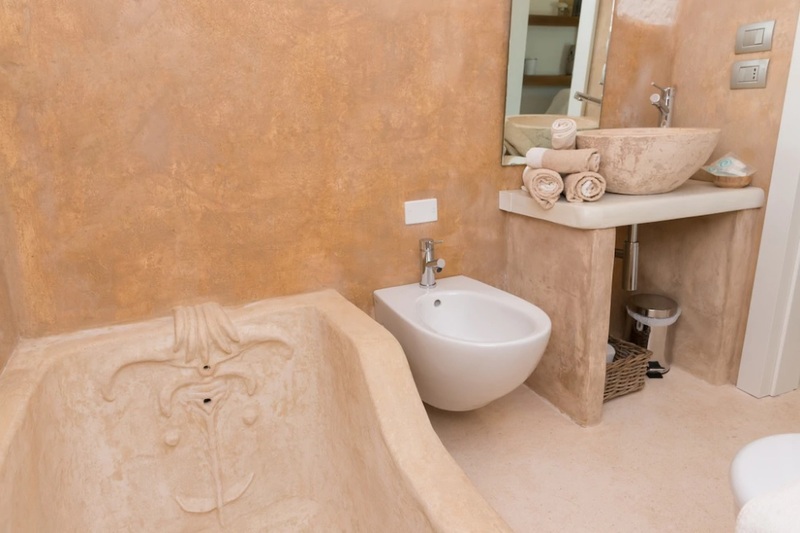 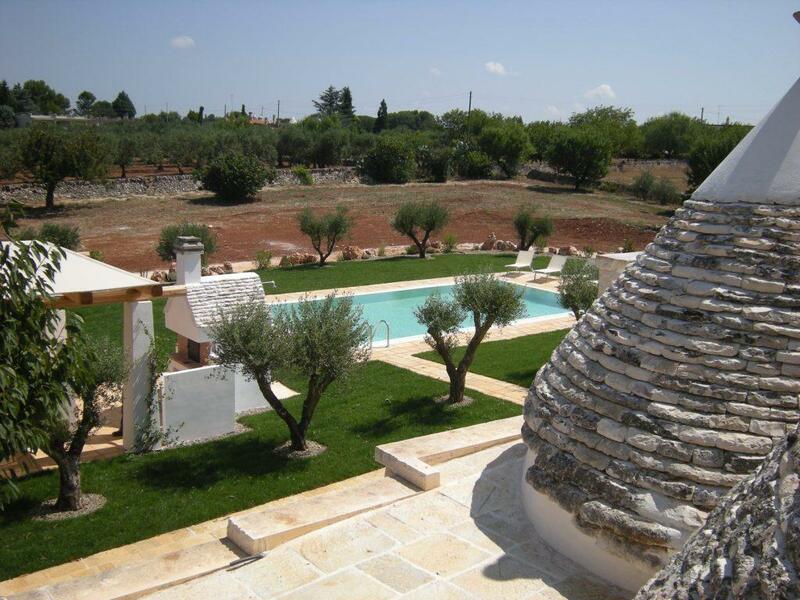 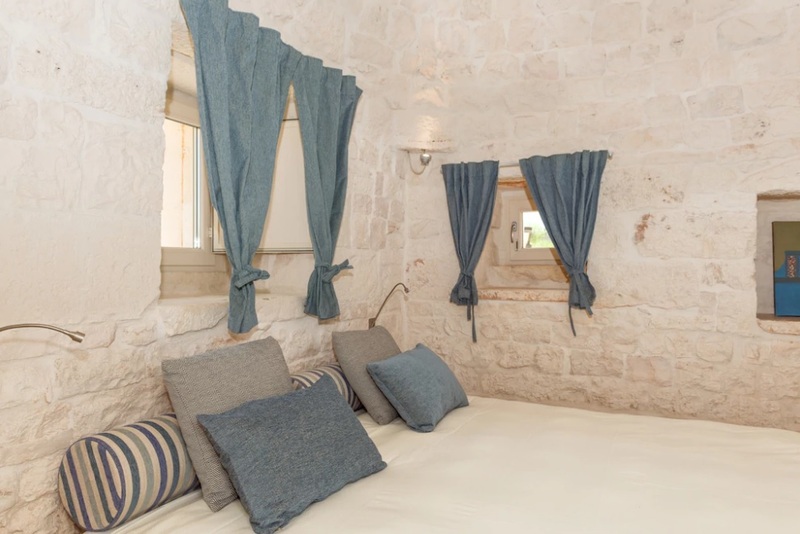 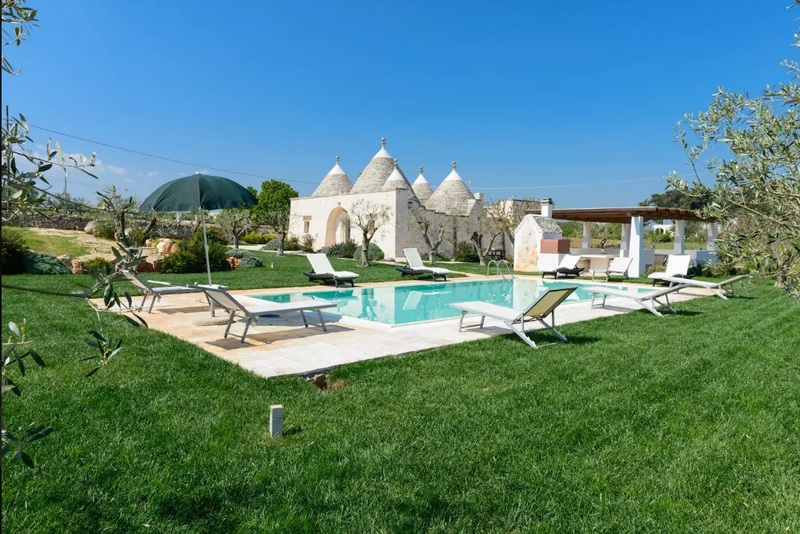 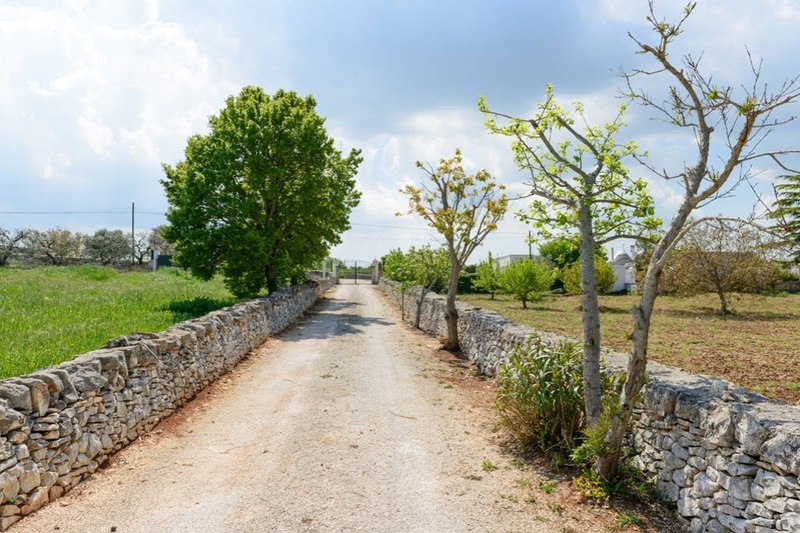 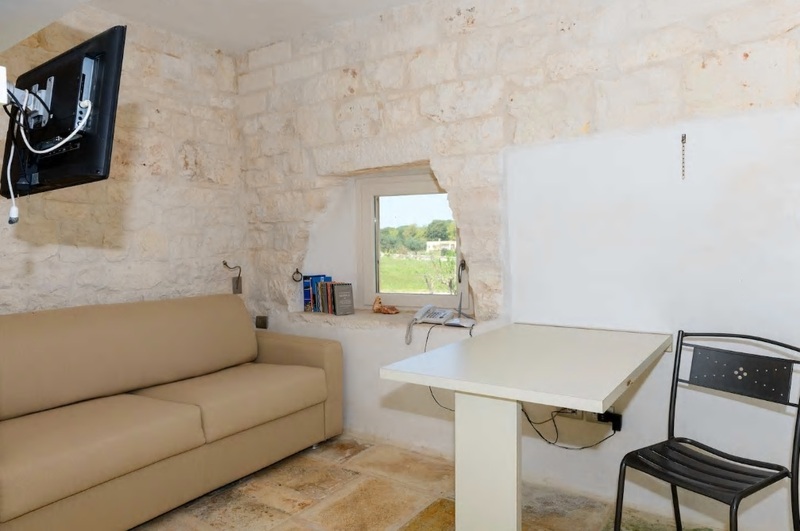 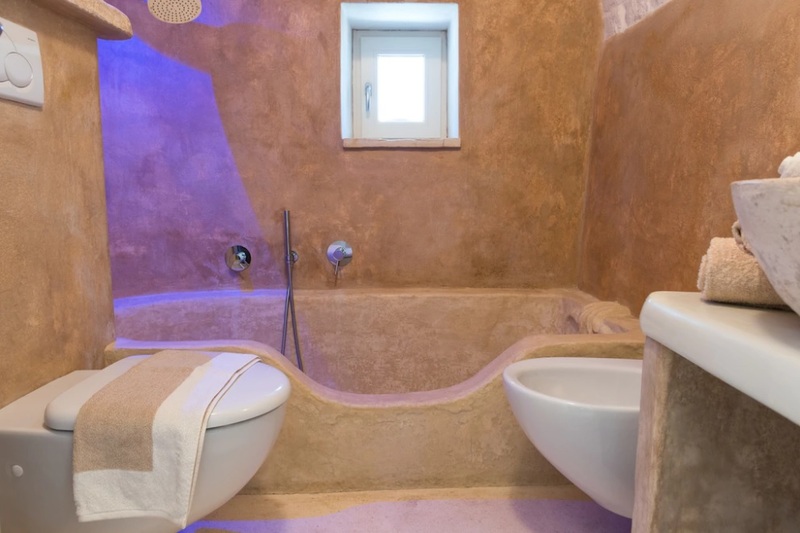 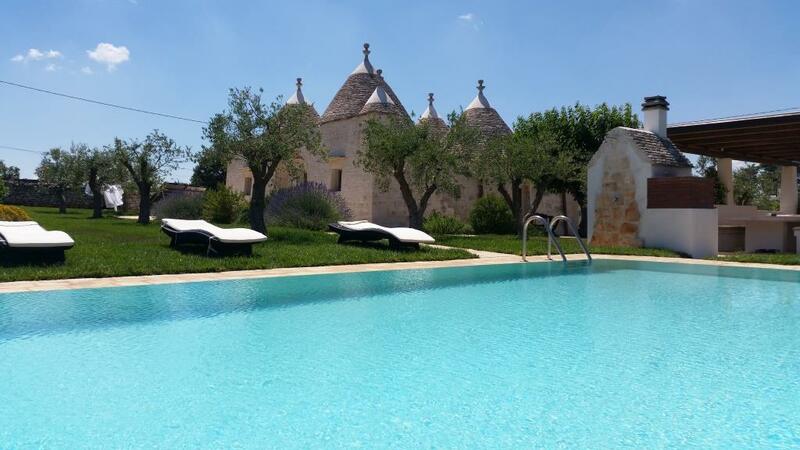 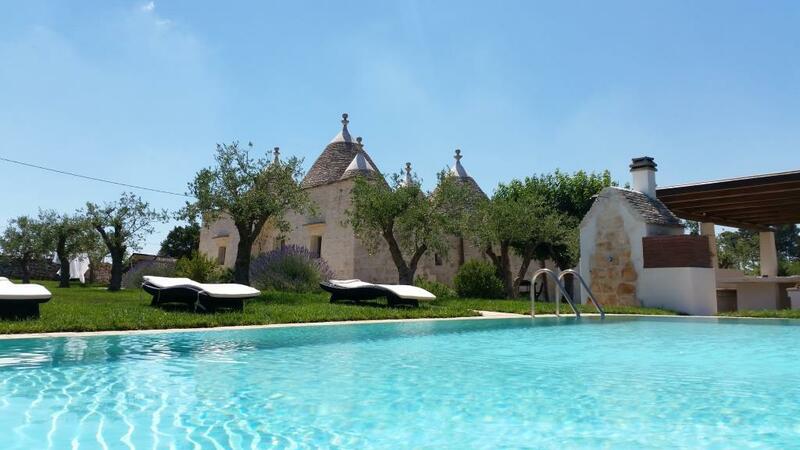 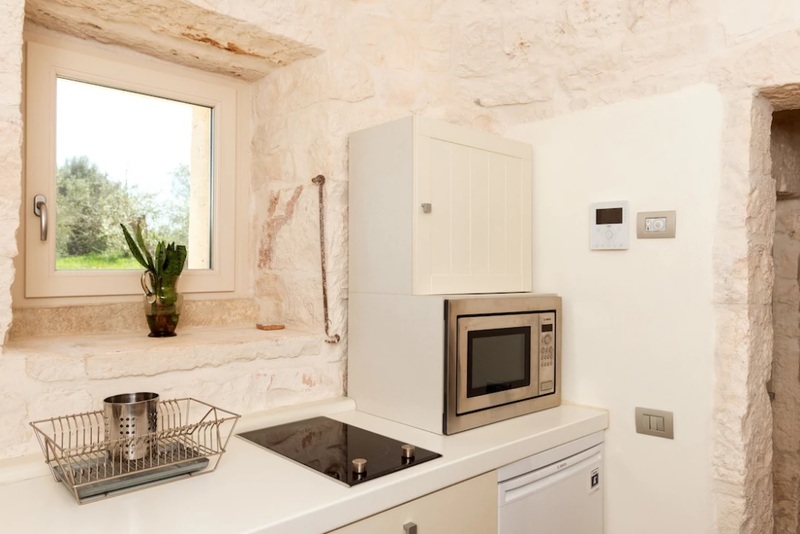 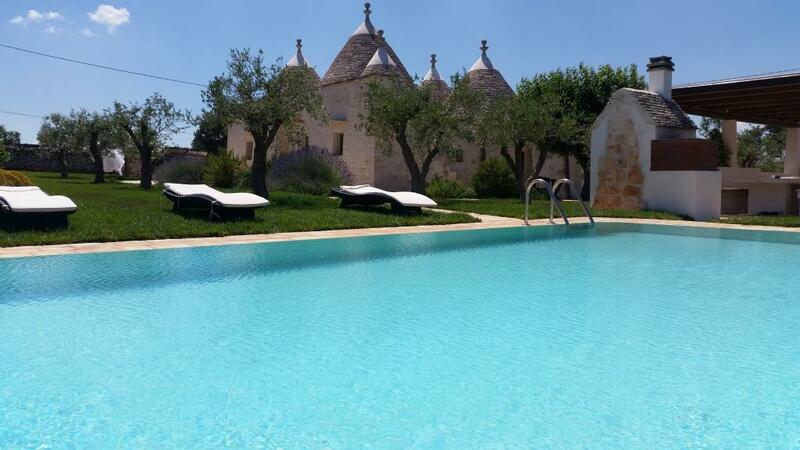 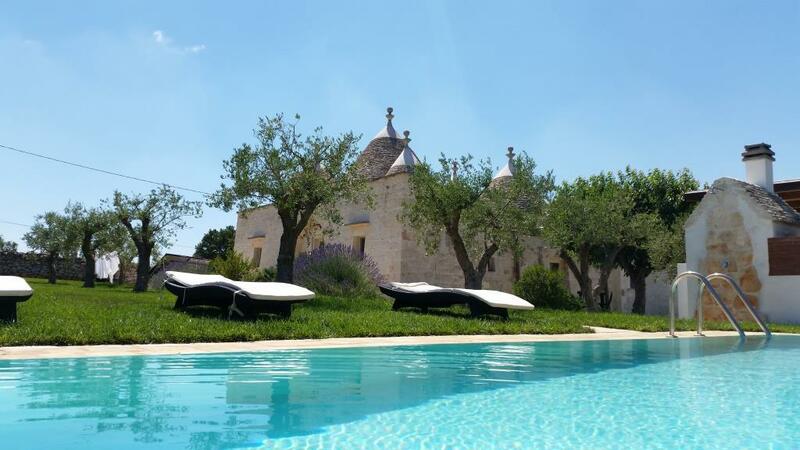 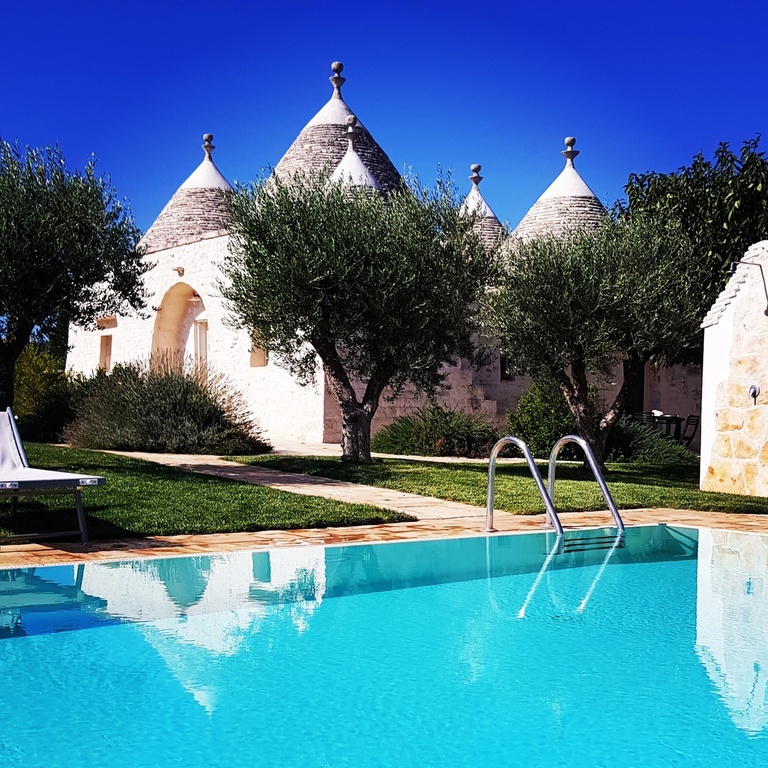 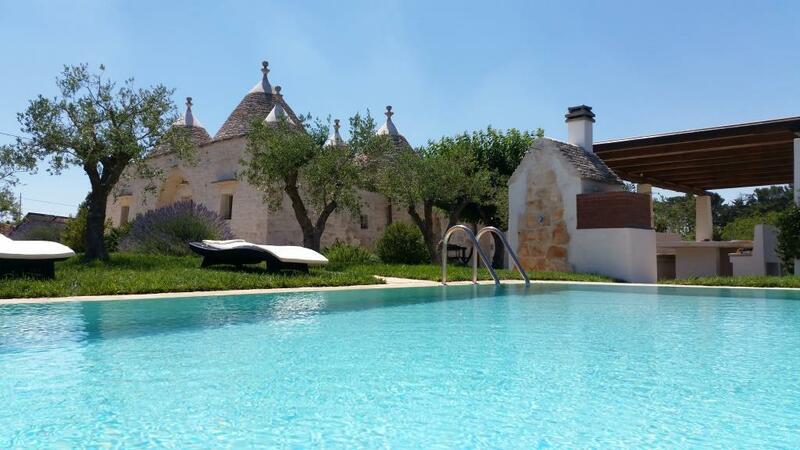 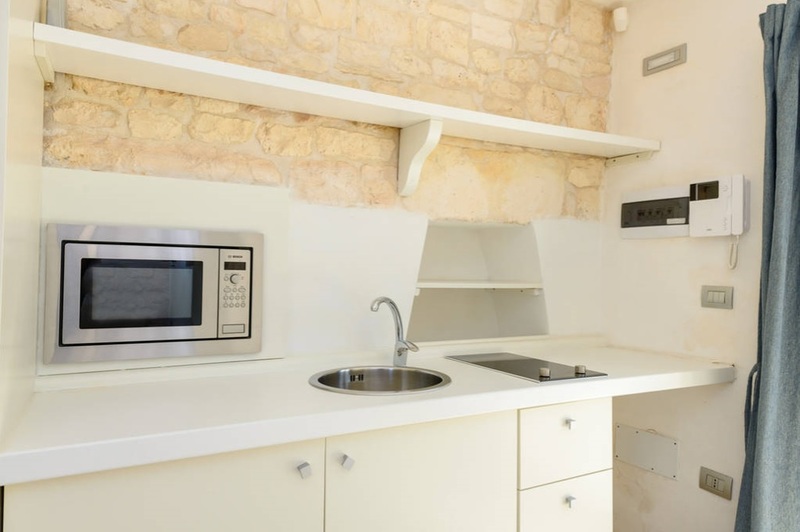 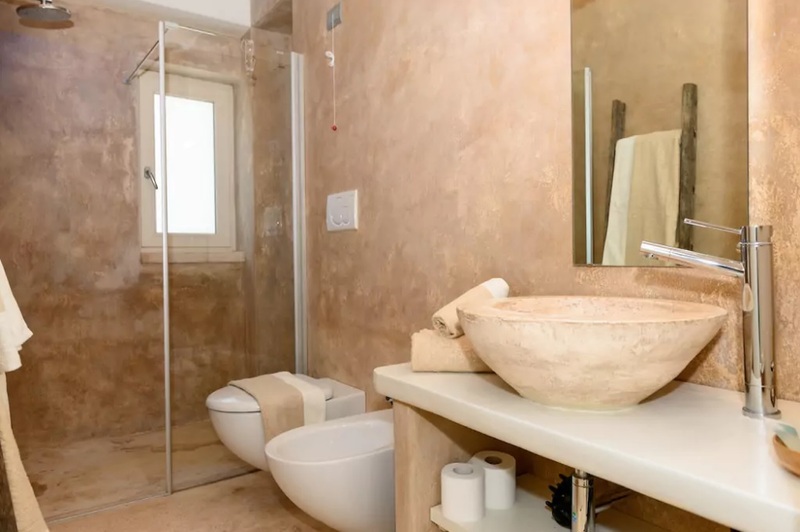 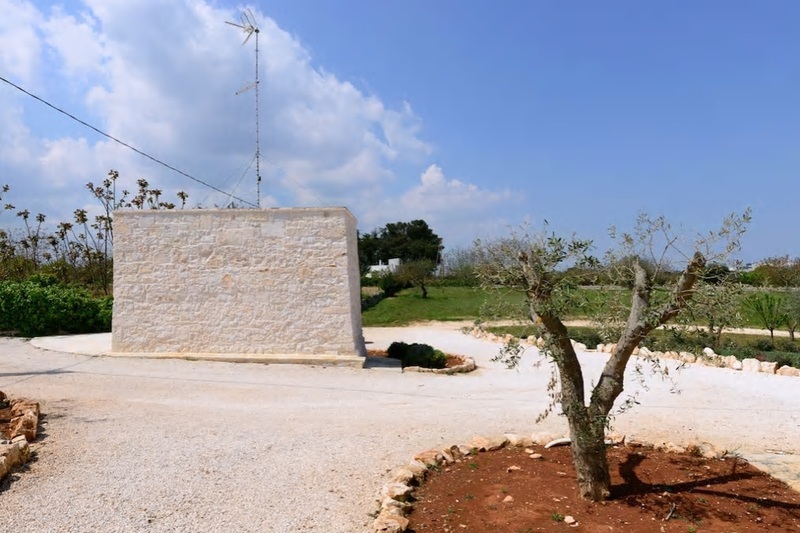 Trulli Terrarossa with pool, is an outstanding example of Trulli for rent located in the heart of the beautiful Valle d'Itria , equally far away from Martina Franca (4km) and Locorotondo (4km) . 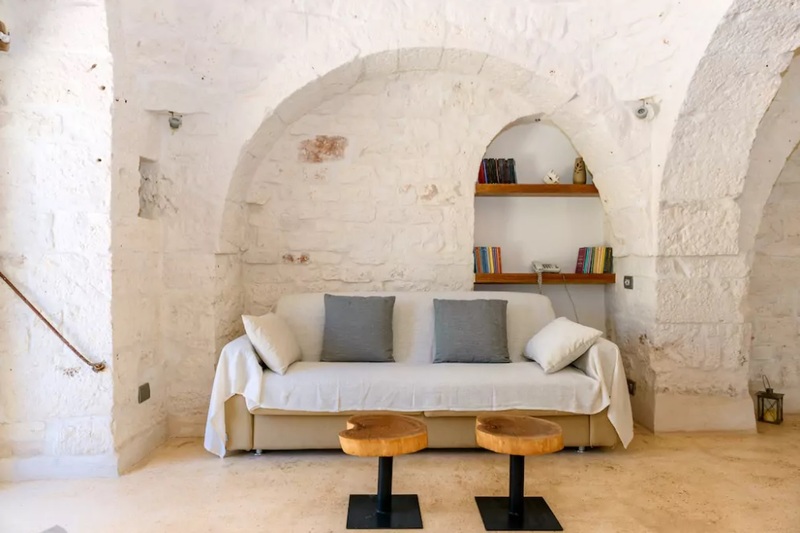 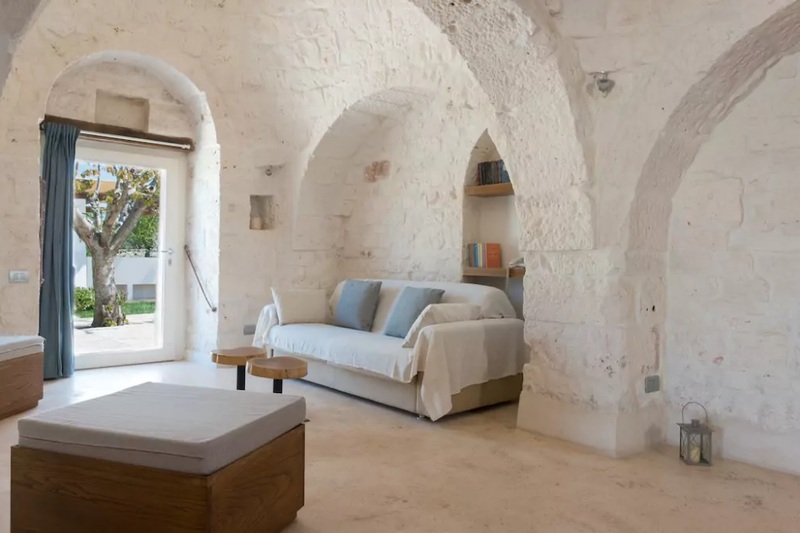 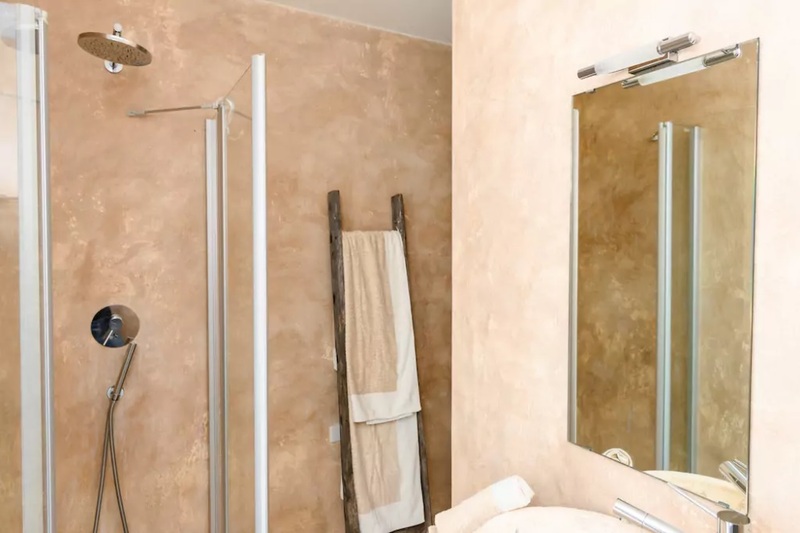 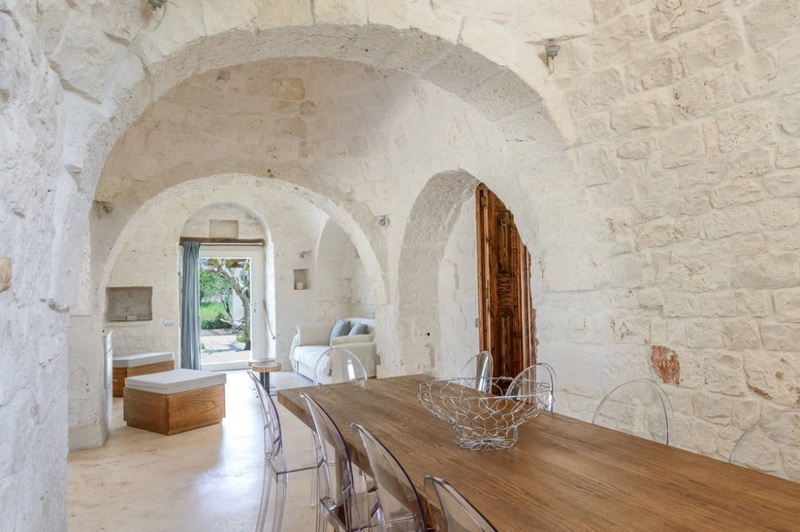 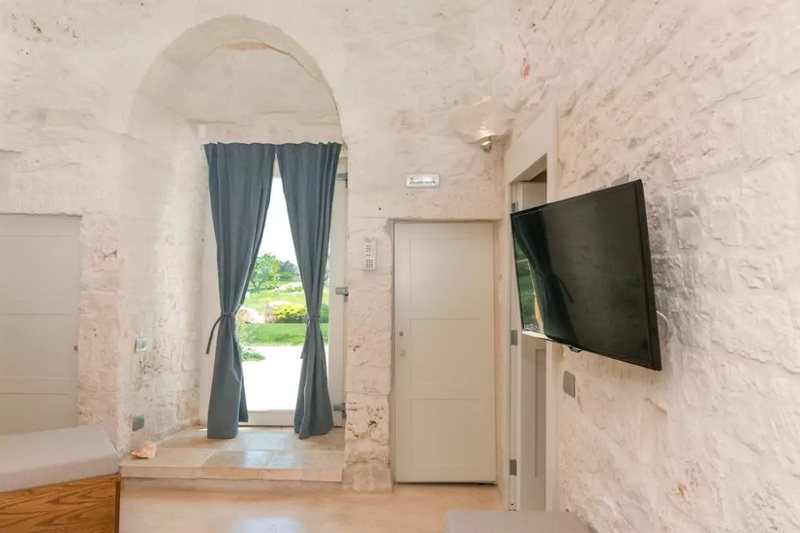 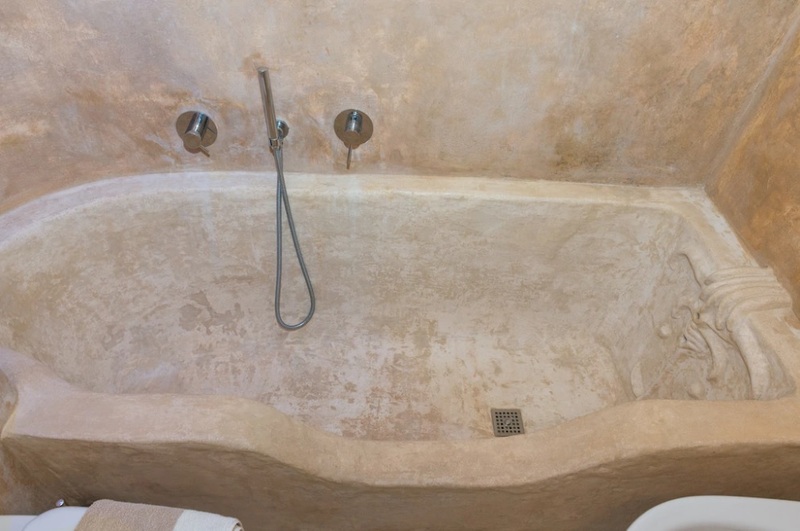 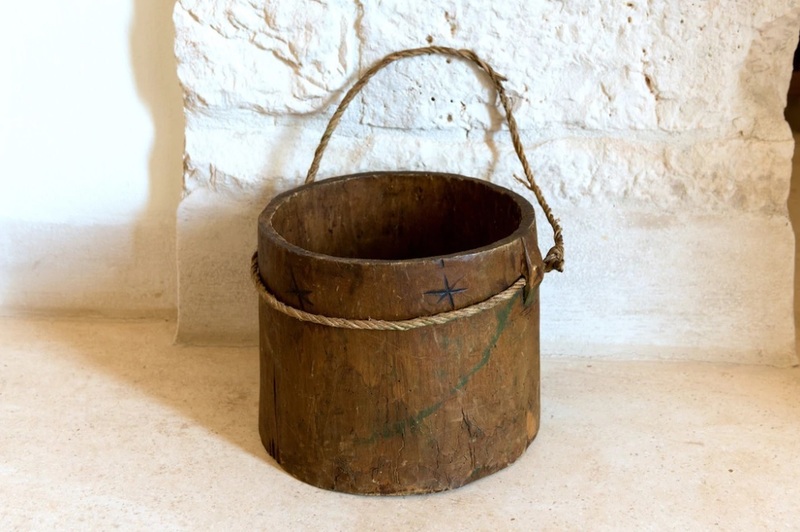 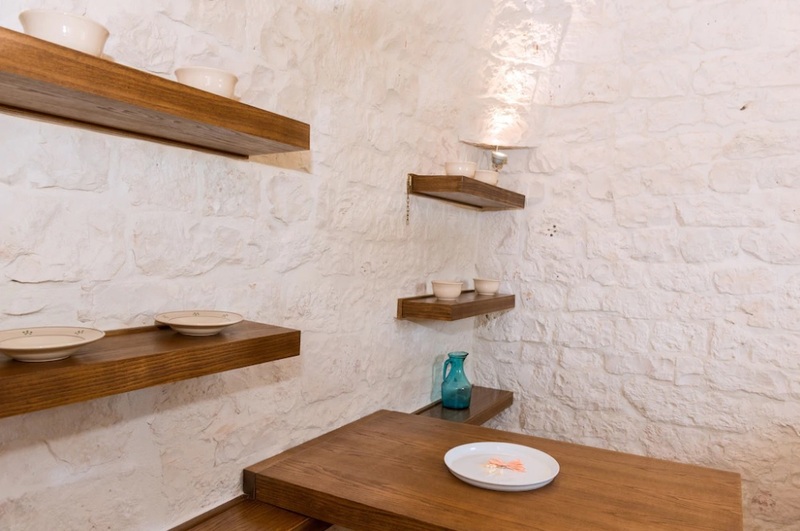 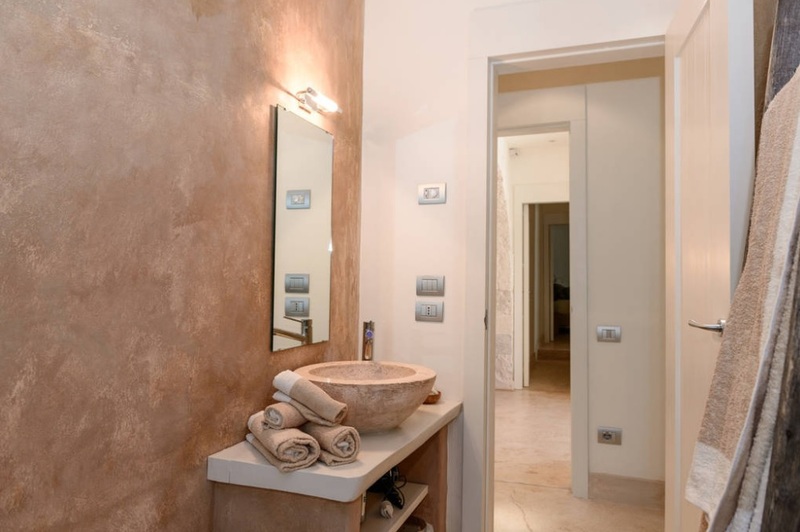 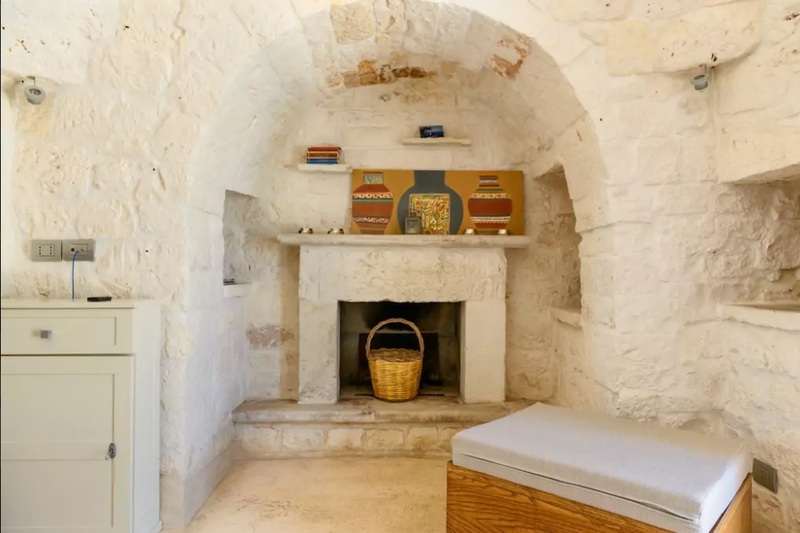 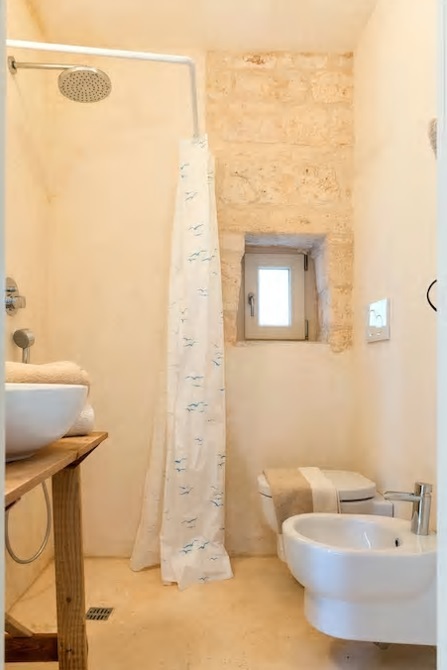 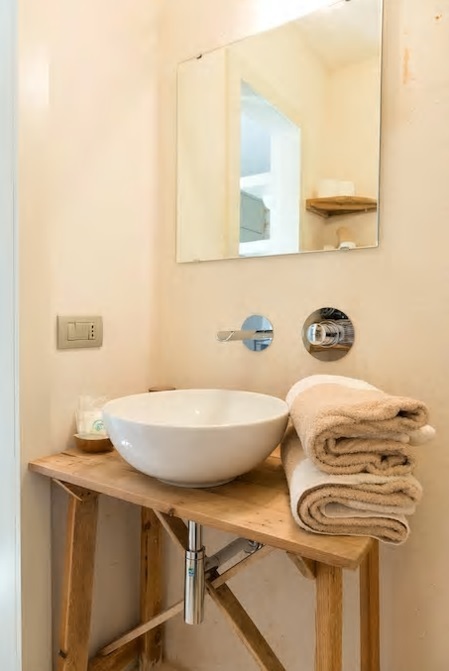 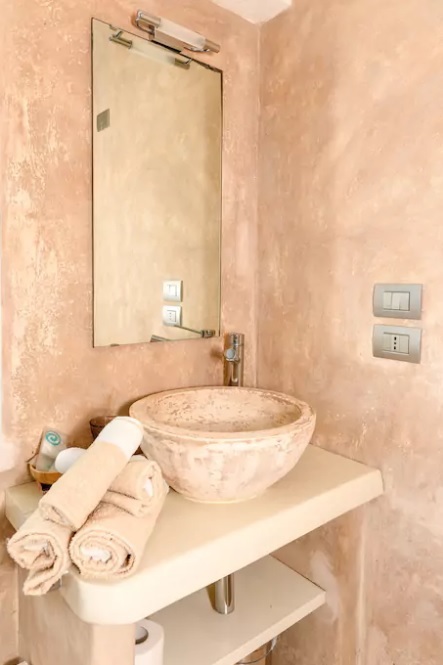 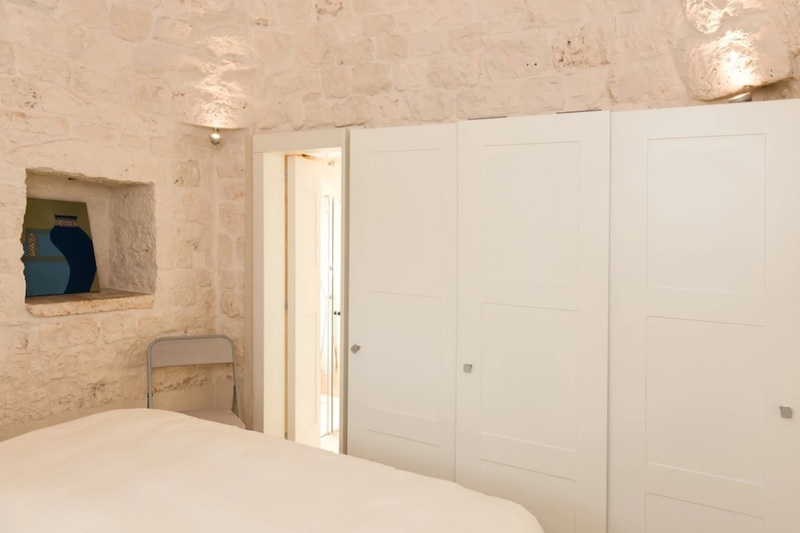 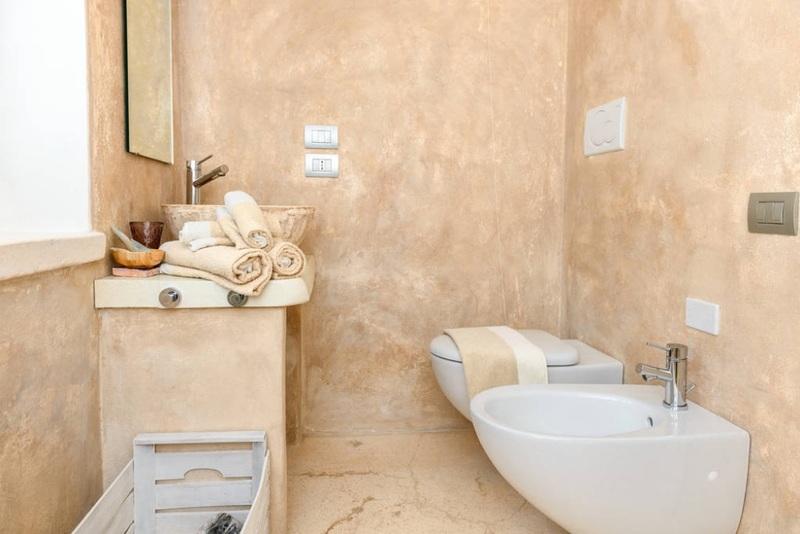 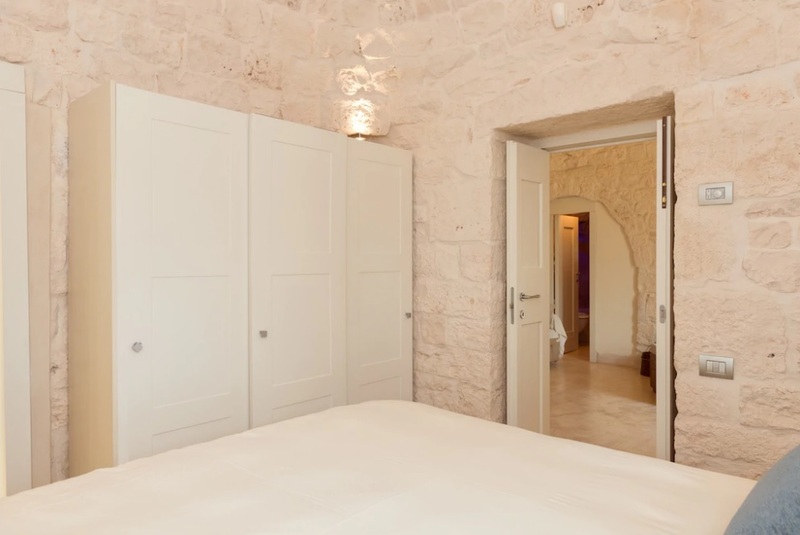 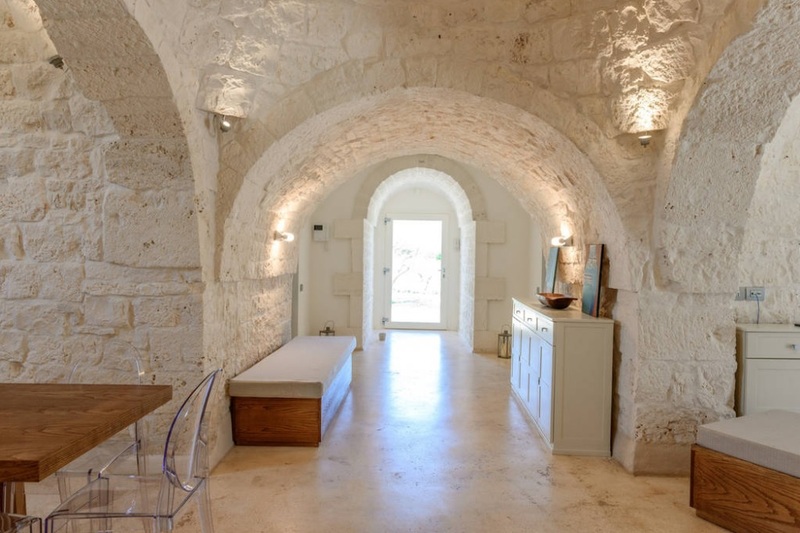 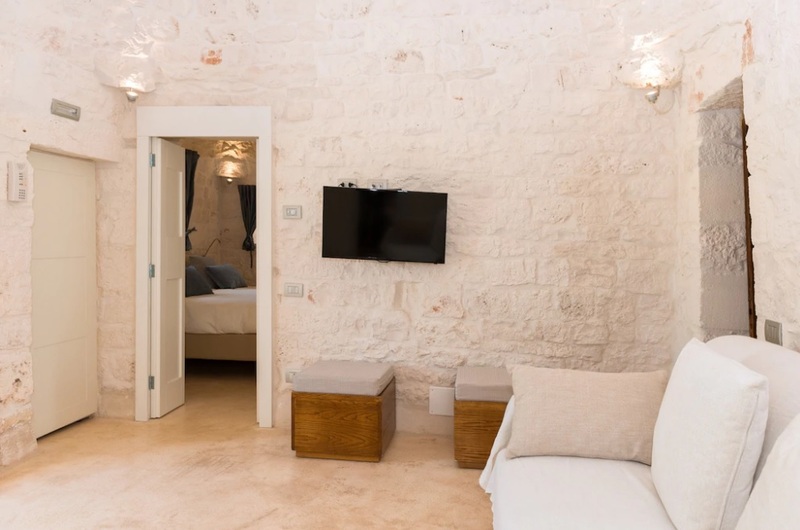 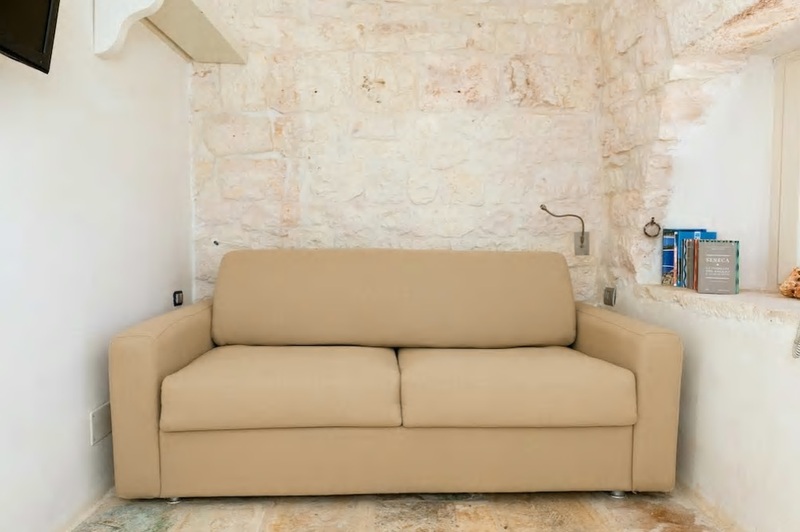 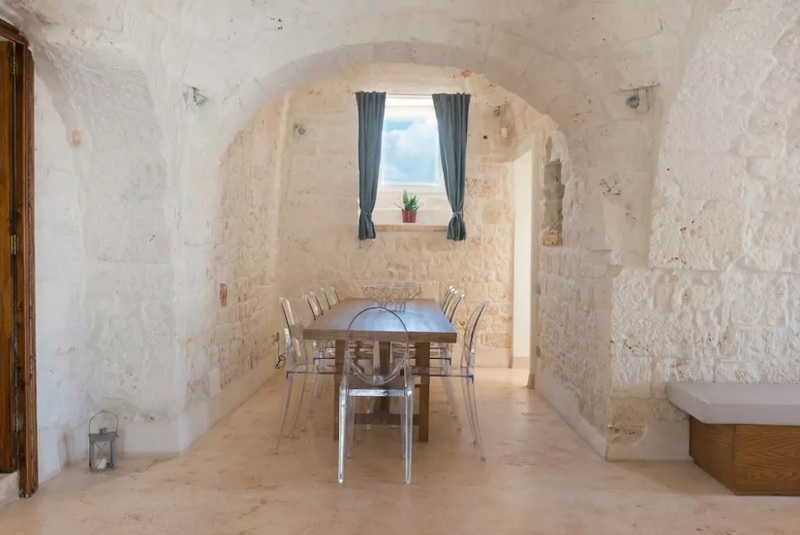 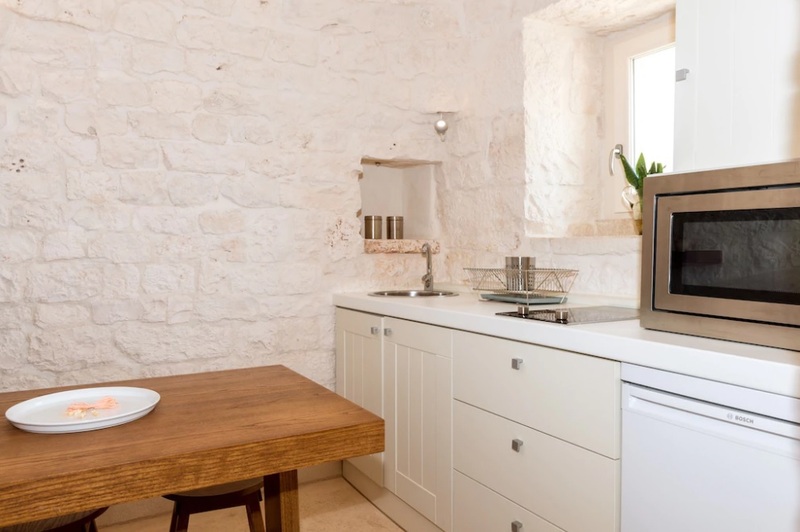 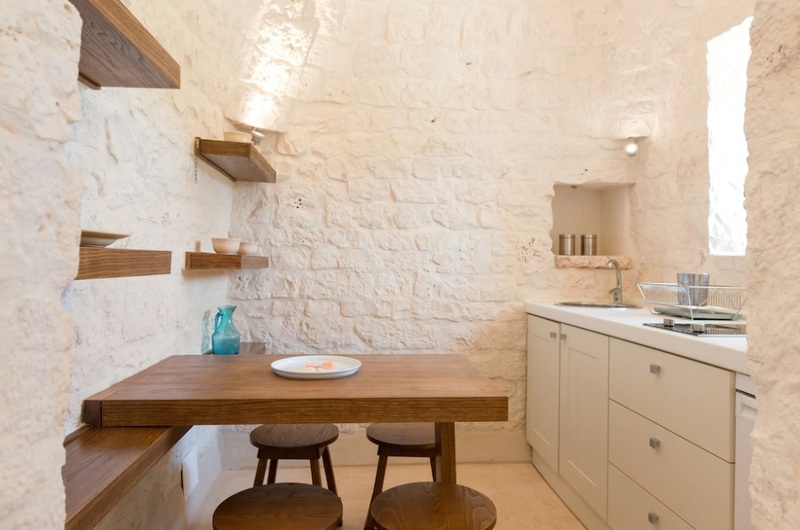 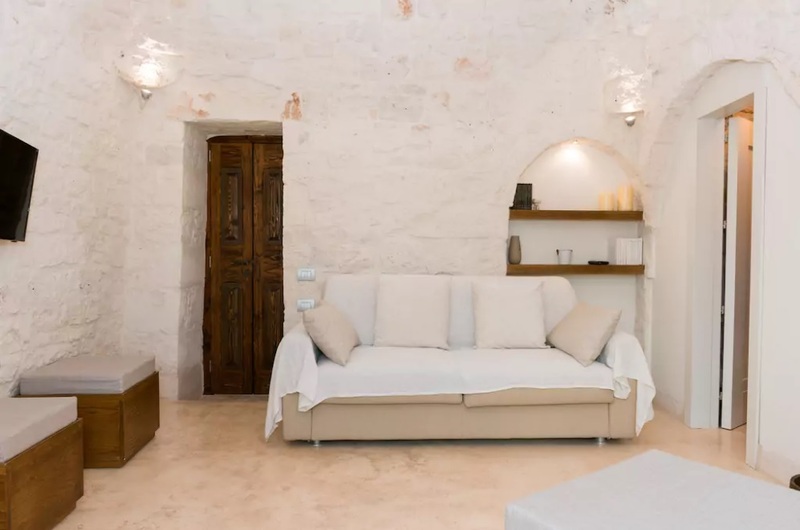 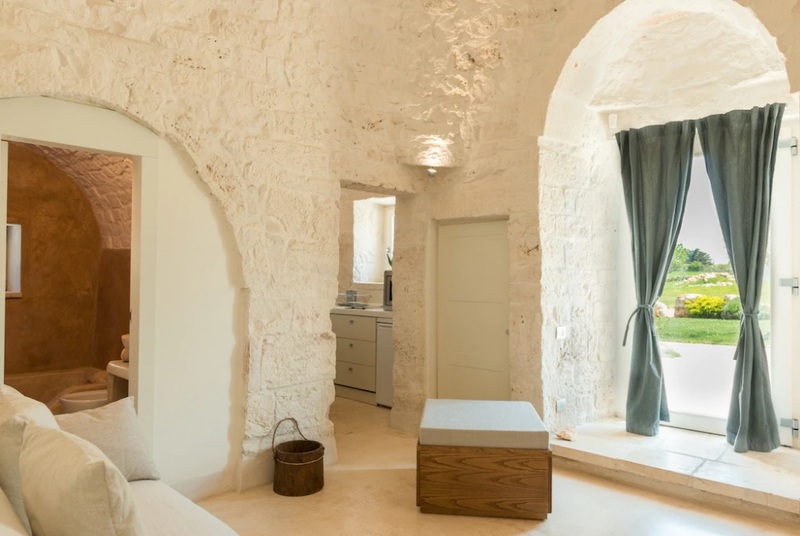 The property consists of a main building with 6 cones, finely restored, respecting the standards typical of Puglia: the high vaults, arches, furniture and fabrics enhance the soft tones of the local stone, restored to its original color. 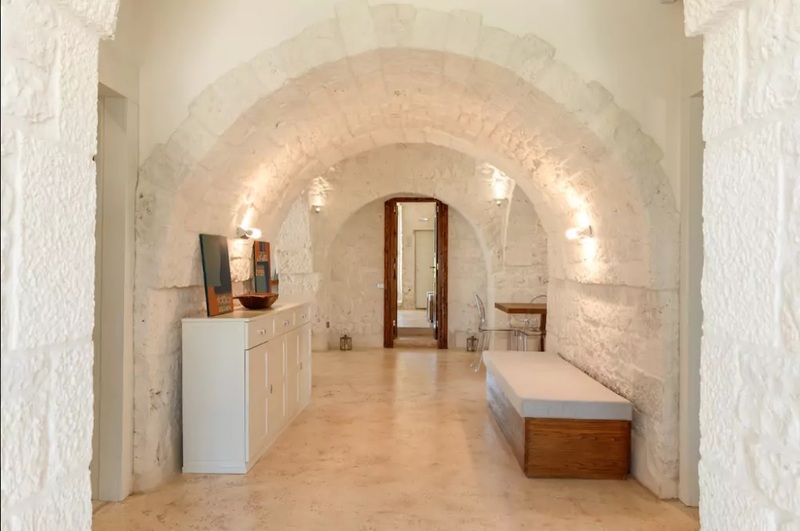 Inside, the house is on 270 square meters of living space and is composed by home entrance, living area with sofa / bed, stone fireplace, main kitchen with external access equipped with every comfort, 4 double bedrooms each with bathroom, living room with sofa/ double bed and exterior views, full service kitchen. 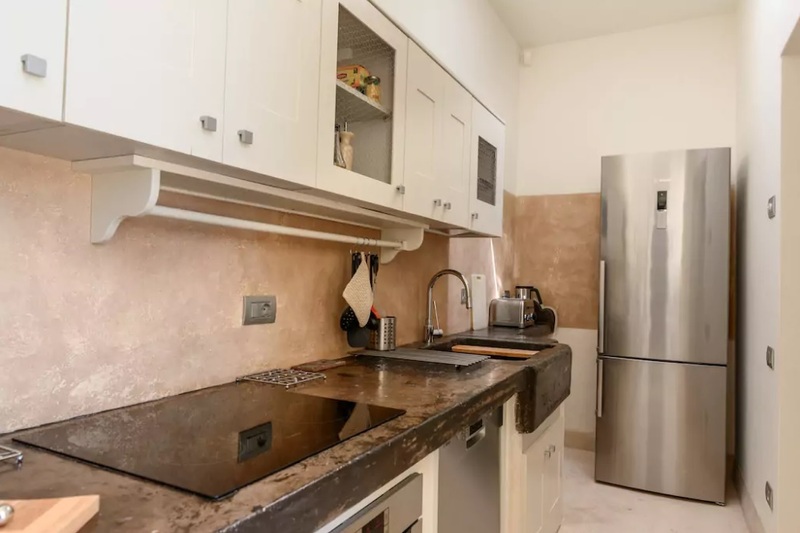 Outside, Lamia Dépandance completely independent from the central house, available for 2 people, furnished with sofa/double bed, kitchenette, bathroom with shower. 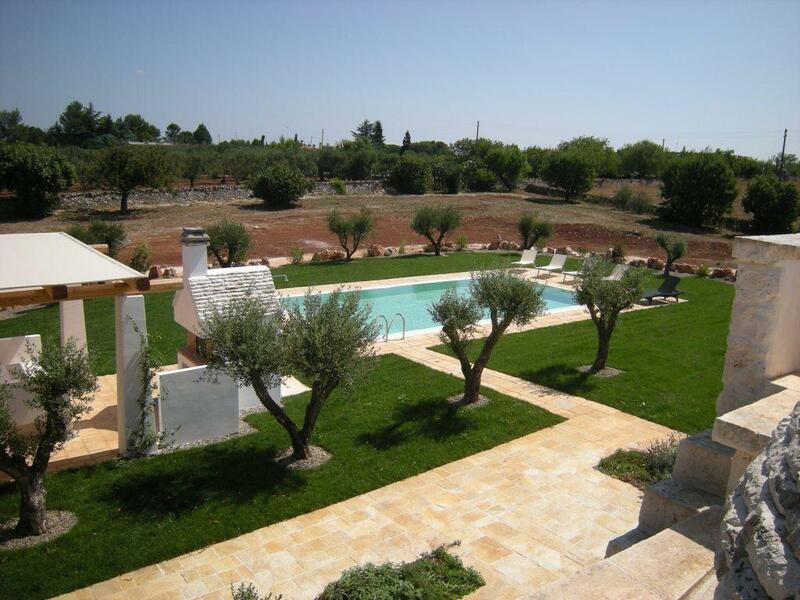 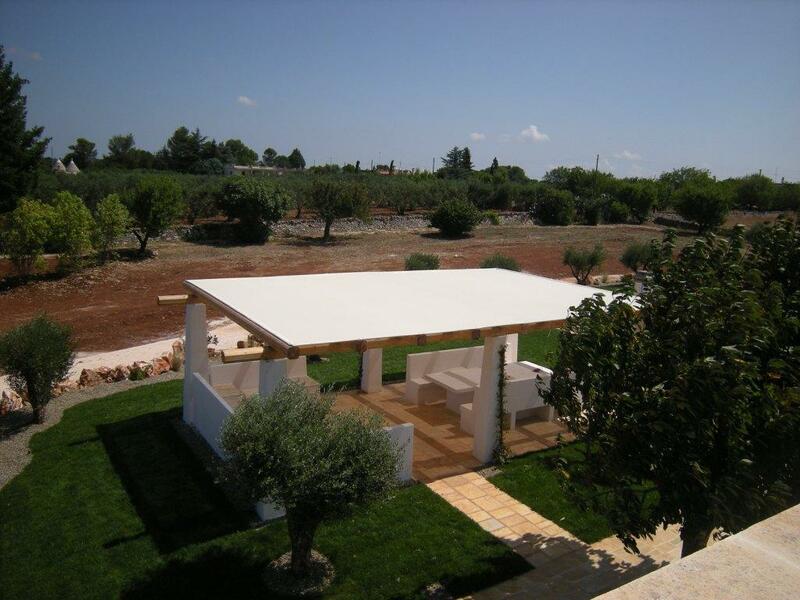 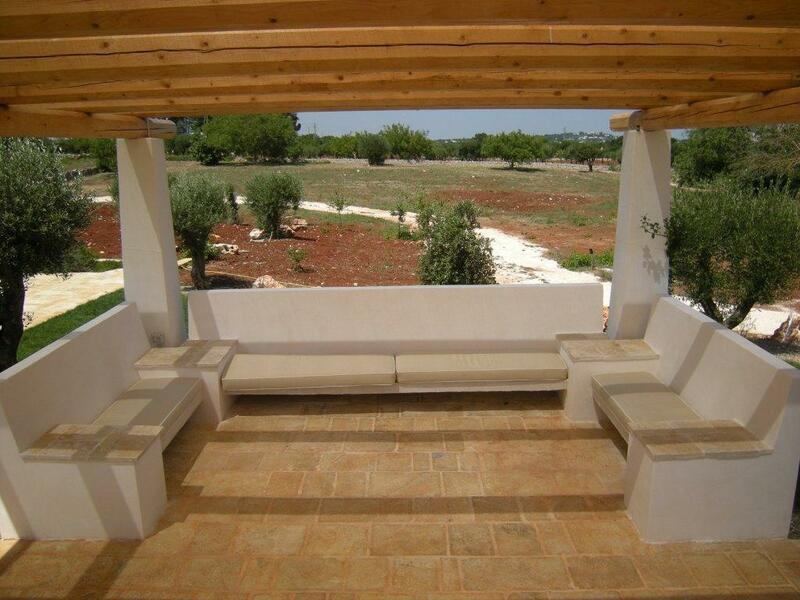 Private garden of 1 hectar, fully fenced and decorated with lawn, olive trees and Mediterranean plants. 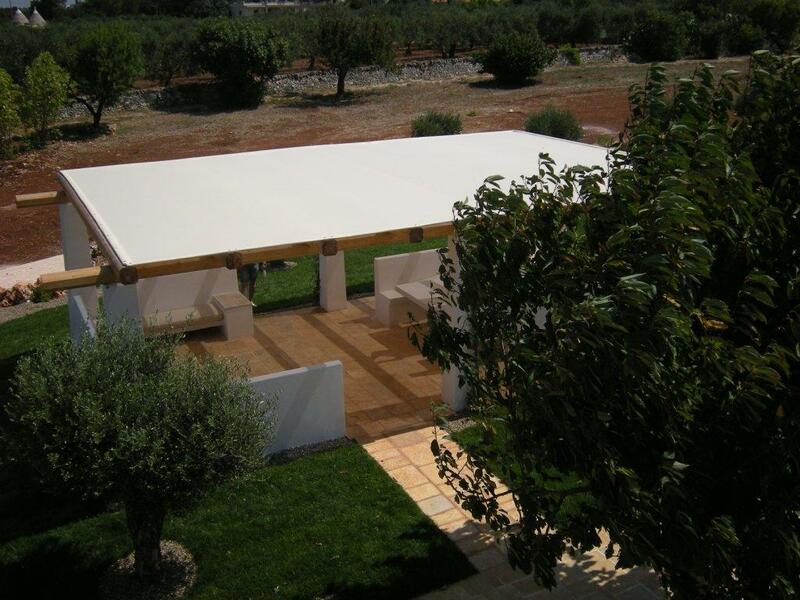 Wonderful covered patio with barbecue and outdoor shower facility. 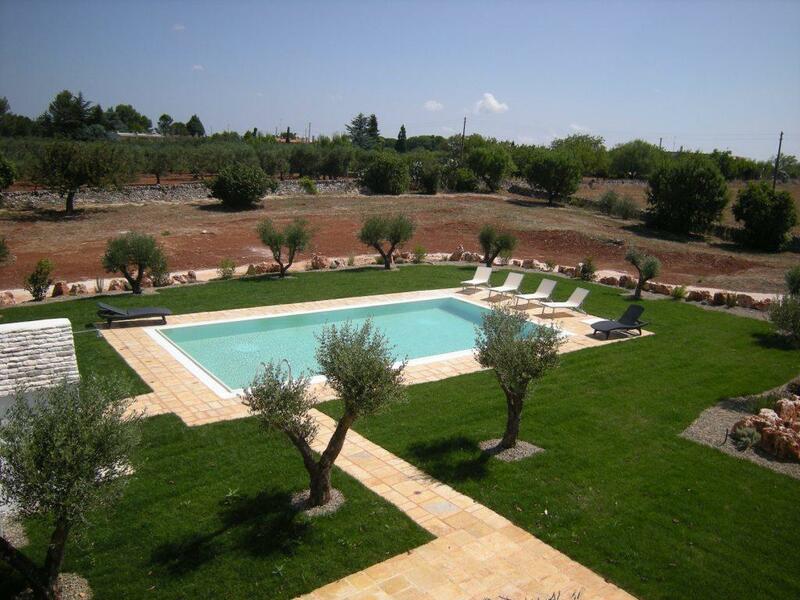 Charming pool 10x5mt. 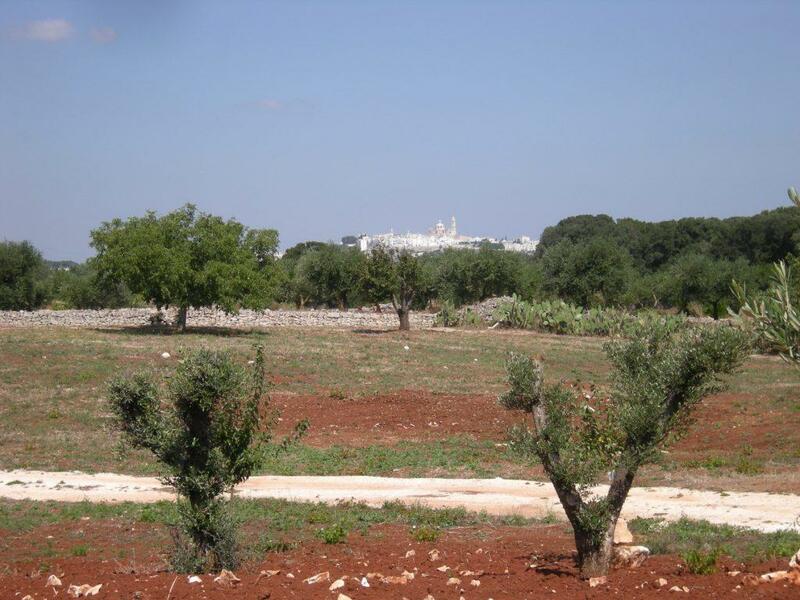 Jogging area of 400 meters around the property. 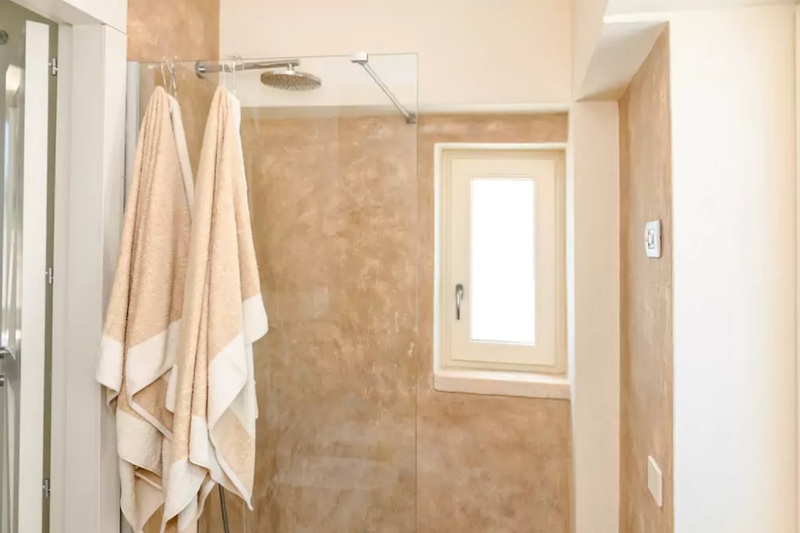 Radiant heating and cooling with air dehumidification system, to ensure a perfect comfort throughout the year. 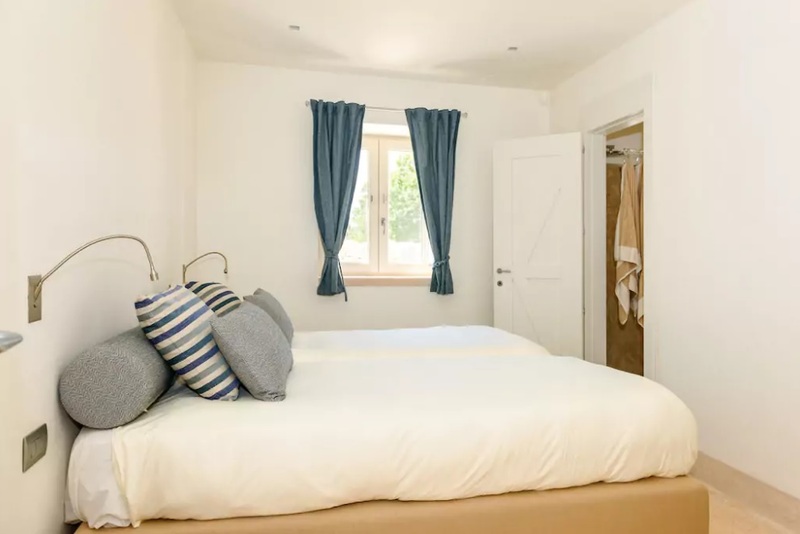 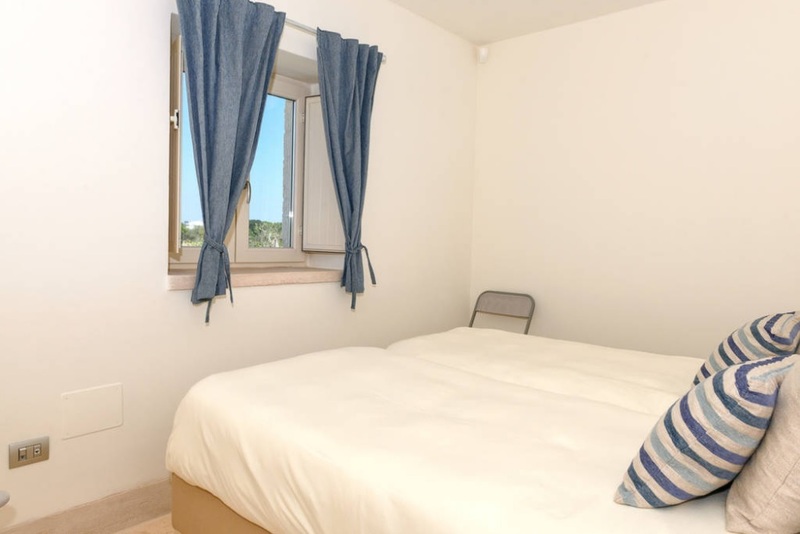 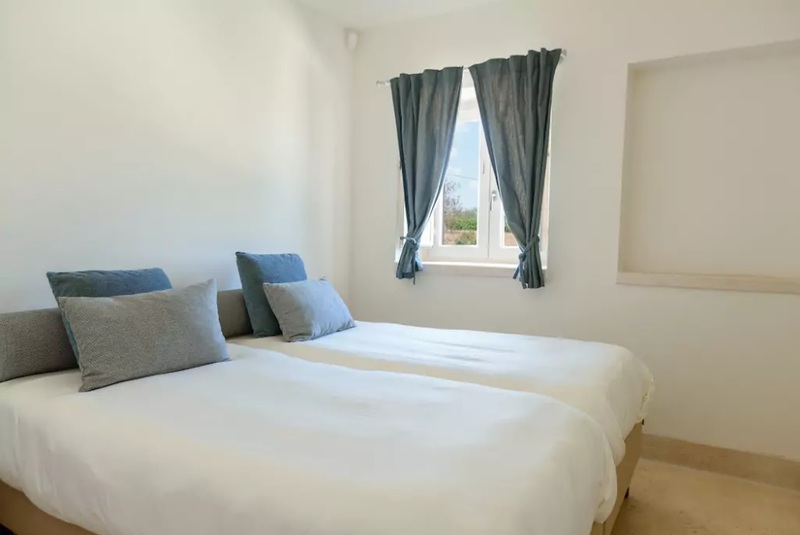 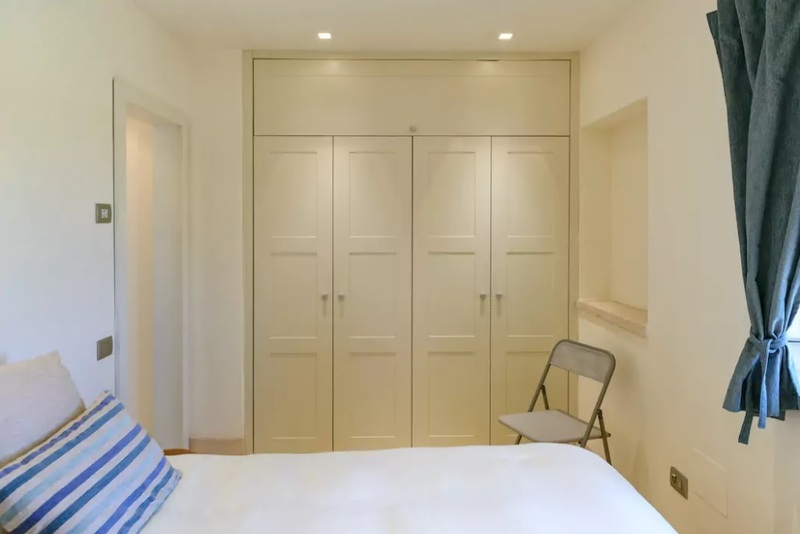 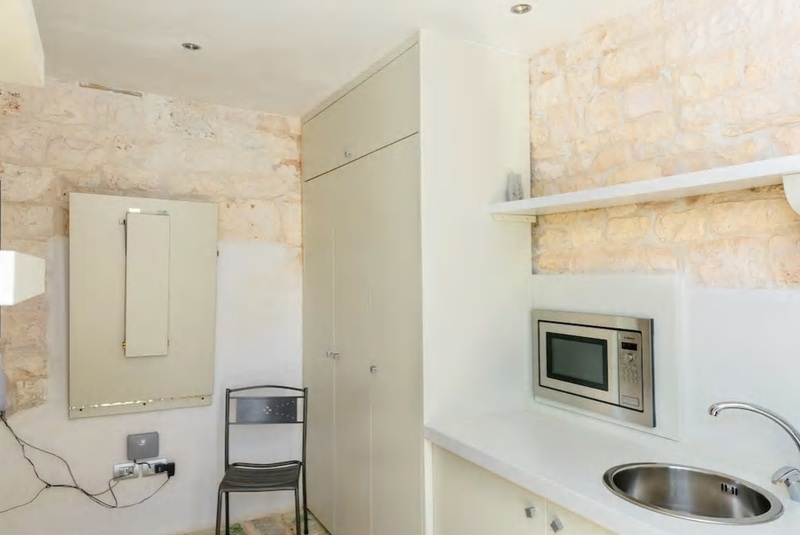 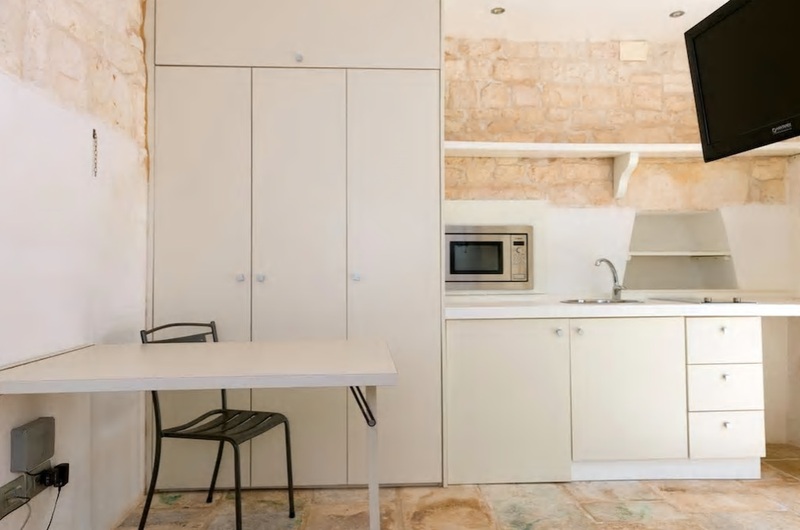 Linen and Towels; 8 Electric Cookers; Stoves; Hoven, mixer, coffee machine, Dishwasher, washing machine, Satellite tv, Frindge; Garden Furniture, pool, heating, air conditioning; INTERNET WI FI. 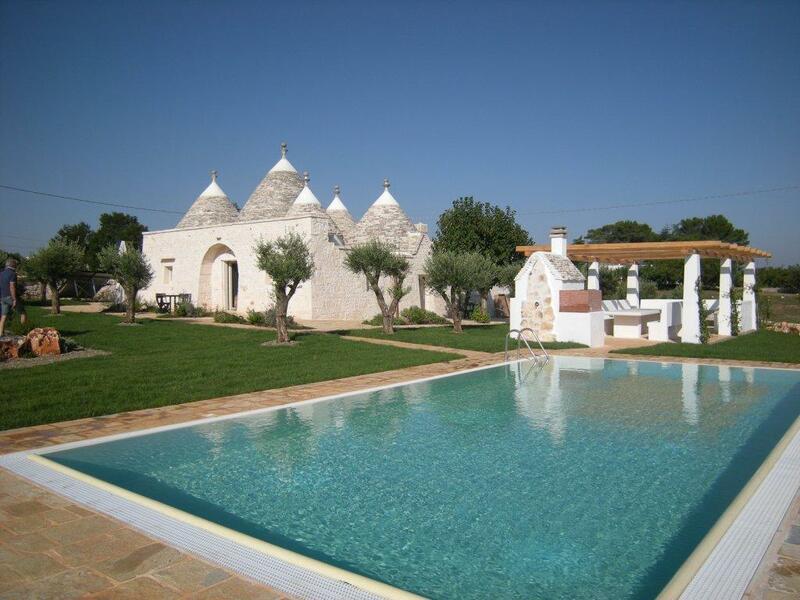 Bari Apt 70km, Brindisi Apt 30km, Pub/Restaurants 4km, Shop 4km, Banks 4km, Hospital 4km, Station 4km, Brindisi Port 30km, Beaches 15km (Lido Rosa Marina, Pilone, Lido Le Dune), Golf 25km (Fasano - Coccaro Golf), Alberobello 20km, Locorotondo 4km, Martina Franca 4km, Polignano 20km, Lecce 80km, Bari 70km, Taranto 70km.